You never know just what you’re gonna get with the Lamb & Lion label. I expected this gal to be of the ccm variety. 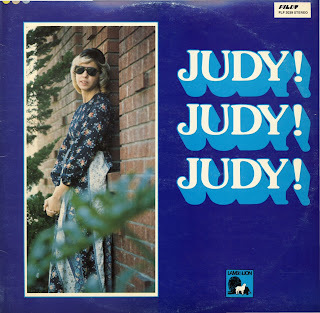 That’s more or less the case, but Judy’s got at least two formidable rockers here: ‘Won’t Talk About Love Anymore’ and ‘Power’, both with heavy electric guitar and big organ. Also a couple soft lounge-jazz tracks (‘You’re All The World To Me’ and ‘The Word’). Elsewhere it’s mostly gospelly light rock, pop and ballads with big arrangements, some horns, Judy on piano and several background vocalists including Danniebelle Hall. Closes with a cover of ‘Magnificent Sanctuary Band’. Back cover says that she has been blind from birth, accepted Jesus in 1972 and has performed as a member of the Latinos. (Ken Scott – The Archivist). Couldn’t say that I particularly liked this one though Judy was super talented when she made the album. I think that I found it derivative, which isn’t a bad thing, not at all (much stuff that I like is derivative ! ), it’s just that for each of the songs, I have dozens of equivalents that sound kind of similar and none of hers were sufficiently different for me to say “yeah !!”. I’d say Ken calls it absolutely right on this one. 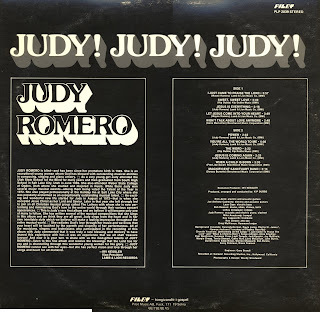 I sang back-up on the Judy, Judy, Judy album in 1975. How can I get my hands on a digital copy? I would love a digital copy myself, Judy. Thank you for inviting me to participate as one of the corale background singers. I am so sorry I could not make it to your wedding. I really wanted to go, but we were out of the country at that time. Shalom! I recently started going through some of my moms albums.I found this one it reminds me so much of her she passed in 1987.She had great taste in christian music I wish I could purchase Judy!Judy!Judy! in a CD. If someone knows where please respond thank you. 1-4 Let Jesus Come Into Your Heart 3:49 Was one of the first Christian Songs I sang… I would love to find a CD of this album….or even the vinyl record…….